Quick, pop quiz! OTHER than New York City, what was my favorite place I’ve ever visited? NO, not Poughkeepsie, although some of my favorite people live there. NO, not Albuquerque, although that’s a good guess because you know I love places with “q”s in the name. I think I might have driven through there once, and it was pretty, but too sandy for me. I like green. And trees. Cactuses and pebbles have their place, but give me trees and lawns any day. When I was twenty, I went to Rome on spring break, the semester I was studying abroad. We spent three or four days there and I fell in LOVE. The people were warm and friendly (and everyone was so beautiful, my goodness); the food was AMAZING (I still think about the gelato and drool a little, discreetly, into my sleeve, of course, like a LADY); the landscape and views and general atmosphere were so welcoming and so beautiful and so…I don’t know. Homey? I felt at home there. We went to a lot of places on that trip, but there was no place that felt as comfortable as Rome. I didn’t want to leave. I wanted to stay and soak it in for a while longer. Or maybe forever. If I were given unlimited money, I would first buy a home here (because this is home base) and of course a home in New York City (because, well, New York City) and then a home in Rome. Then I’d be done. And I would just cruise between the three places. And fly my friends in for long periods of time. Like a rich person does, you see. ANYWAY, a couple of days ago, I was on the phone with Dad, and Mom was all “give me the phone I HAVE NEWS!” Well! I like news! Who doesn’t like news, you know? So! Guess where Mom’s going in October? Mom’s been to England and Scotland, but never Rome. And Mom’s Catholic. No, please, let me amend. SUPER-CATHOLIC. Like, she should get a cape and probably a belt with a big belt-buckle or something with SC on it. She is JUST THAT CATHOLIC. So where would super-Catholic people like to go? What is their (sorry for the analogy, but it’s apt) Mecca? Rome, of course. “Yo yo yo, where ma homies at?” is not a thing I said at St. Peter’s, Mom. Also, I didn’t even laugh at the half-naked statues. Like a LADY. Mom would. Mom SO would. But Mom had a question for me first. “YOU ARE A FOOL, WOMAN. Of COURSE you go to Rome! It’s ROME! You get an opportunity to go to Rome, YOU GO TO ROME! Guess what? I’ll have other birthdays. I plan on having a lot more of them. I’m not even middle-aged yet. Also, you’ll have email, and phones. It’s 2013. You could totally contact me on my birthday. You call M. RIGHT NOW and tell her YES YES YES,” said her evilly mean daughter that is ME. I think it’s funny that Mom was going to jettison a chance of a lifetime for my birthday. It’s not even a MILESTONE birthday, sheesh. And all we do is go to lunch and go shopping. We can do that anytime. See? They’re THERE. I think they were all on vacation when I visited, dammit. It is a RELIGIOUS PILGRIMAGE. Where all you see is RELIGIOUS THINGS. The WHOLE TIME. Mom’s super-jazzed about this so I can’t even pick on her. I mean, seriously, she’s all religious. And she’s always wanted to go to Rome. But then I did a search and saw the itinerary and…can I pick on her a little bit? Just a LITTLE. With LOVE. First, the name of the company doing this tour is Tekton Ministries. I think this sounds like the name of a Transformer. I think any tour would be better with the addition of a robot boombox, right? I found a sample itinerary on their website, which is super-outdated (it says you’d visit Pope John Paul II, and he was two popes ago) but it’s for the most part the same except she isn’t going to the places at the end of the tour. The Sistine Chapel and the Vatican Museum. Fine. I’m down with this. “Mom, wait til you see all the rich stuff in there,” I said. “It makes you sad and think, ‘maybe if they sold some of this stuff, poor people could have dinner. '” “That is NOT what you are supposed to think at the VATICAN,” Mom said. “Those are PRICELESS RELICS.” “They’re not fingerbones of saints, Mom, they’re like gold cups, and there are a kajillion of them, no one would miss like four, and I’m thinking four would feed a minor country, seriously. They are all jewel-encrusted, it’s insane.” “You might have been concentrating on the wrong things while you were there, Amy,” Mom disapproved. Mom will like this so much. I’m excited she gets to see this. Then Mom gets to have Mass with the Pope. She is SO EXCITED ABOUT THIS. This is the equivalent of me getting to see Stephen King, is my thought. She realizes there will be a billion other people in the square and everyone’s getting Mass at the same time, but this doesn’t faze her. No no not even a little. THE POPE!!! I’m not going to make fun of this. This is her most exciting thing. My thoughts about such a thing and the man’s beliefs on social issues don’t play in here. Let her have her happy thing. A church called “St. Peter in Chains.” This is a thing? Apparently so. The internet tells me these are the ACTUAL CHAINS that bound St. Peter in Jerusalem. Huh. There are a lot of ACTUAL THINGS in Rome. How do they know they’re actual? Do you think they test them? The Trevi Fountain! I don’t know what this has to do with religion but I’m pleased she gets to see a touristy thing. “I threw a coin in there once!” I told her. “It’s probably not there anymore, Amy,” she said. “I was just TELLING you, I didn’t mean go LOOK for it, woman,” I replied. Go swimming, Mom, I’m sure you’ll find my coin from almost twenty years ago. “…Pompeii, where you will visit the famous ruins of a once flourishing and prosperous town. It was taken by surprise in 79 A.D. and buried by the ashes of the Vesuvius Volcano.” I like that Pompeii was taken by surprise. SURPRISE! YOU ARE ALL DEAD NOW! WORST SURPRISE EVER! Also, I’m a little envious she gets to see Pompeii. I’d like to see Pompeii. I find things like that fascinating. Mom will be creeped out by volcano-bodies, but I would be so keen on seeing these. Isn’t this interesting? “…the home of Saint Rita, ‘the saint of the impossible.’ We’ll visit her Basilica and view her incorrupt body.” OK, first, my beloved and dearly-missed grandmother was named Rita, and I do so enjoy that she was named after the saint of the impossible. That works on a lot of levels, because a., she made the impossible possible daily because she totally believed in magic, right up until the day she died, and b., she was stubborn as anyone I’ve ever known, so therefore, IMPOSSIBLE. (I think you can see why I loved her so much. We might have related a little bit, right?) What is this “incorrupt body” business? Like, it wasn’t involved in money laundering, or after all these years, it’s not rotted? I’m kind of intrigued but also somewhat disgusted by this. Also at the same place, “we’ll tour Saint Rita’s convent where she received the thorn from Christ’s crown.” WHAT? When were they just handing out such things? That seems hard to prove. How can they prove that’s where that thorn came from and not just from some thornbush? Yes, yes. I understand this is why I’m not the religious type. More the doubting Thomas type, me. I found this online and it’s apparently St. Rita. Who has a nail in her forehead. And all the blood. Saints are horrifying, right? “We’ll visit the Basilica of St. Clare and view her incorrupt body.” MORE INCORRUPT BODIES! Listen, this is the land of the mob and the Godfather, there’s a lot more corruption there than this itinerary is making out, is my thought. Also, as we learned just the other day, St. Clare was the aunt of St. Amata, also known as St. Aimee of Assisi. St. Aimee! ME ME ME!!! Well, I looked it up, and it’s AT A CHURCH, Mom. It’s at a church with the RELICS OF ST. VALENTINE IN IT. So that is VERY religious. Maybe you’re just a liar and you’re scared you’ll come back all one-handed, did you ever think of THAT, Mom? Hmm? So this sounds very much like a trip that Mom and friend M. will enjoy, because, well, all the religious things and incorrupt bodies (which I looked up and it means they kind of self-mummify rather than rot away to bones, and the photos are…well, kind of horrifying, to be honest) and Jesus-thorns and churches and Popes and such. If *I* went on a trip to Rome, however, my trip would a lot less religious and a lot more…pasta, bread, and gelato-filled. Museums. A trip up to Venice, which I didn’t get to see. A trip to Florence, which I missed out on. And then more carbs. MORE DELICIOUS CARBS. Until I pretty much died from carbs. And was buried in Rome. Or perhaps became incorruptable, who even knows what might happen, that seems to be a thing there. I want ALL OF THIS IN MY MOUTHHOLE. Now, please. Happy trip to Rome, Mom. You deserve the best time. If that’s all saint-mummies and religious relics, go, you. I hope you have the best time. You’d better bring be back some kickass souvenirs, though. You are MISSING my BIRTHDAY. Can you even IMAGINE such a thing? Sheesh. This entry was posted on Thursday, April 4th, 2013 at 11:45 am	and tagged with conversations, family, Italy, mother, religion, Rome, saints, travel and posted in family, travel. You can follow any responses to this entry through the RSS 2.0 feed. Awww! I’m so excited for your Super Catholic mom! I would love to see all these things, although I’m not sure I’d want to go to the Pope’s mass. I think he’d have Pope x-ray vision and KNOW I haven’t been to Confession in 16 years… Also. We have that transformer. In a display case in my basement. The Shrine of the Incorruptible Optimus Prime, if you will. Nah, the Pope wouldn’t care. There are a LOT of people at that mass. I’m sure so many of them have worse sins than yours! I don’t think my brother ever had that Transformer. I don’t remember which ones he had. None of the big ones. We watched the show CONSTANTLY, though. I knew all of those Transformers by name. Yes, you MUST go to Florence. It beat the pants off of Rome, for me, but this was also because it was August and Rome is freakin’ hot in August. Oh, also! There was a big gay pride parade when I was in Rome, so we couldn’t get off the subway at Circus Maximus because hot, gay men were blocking it, I guess? Though I imagine I feel the same way about Rome as I would visiting Greece, Turkey, or Egypt–amazing history and whole civilizations happened HERE! I know, isn’t it awesome? I’m so happy for her! Someday. Someday I will go back and see Florence and Venice and Rome again. It’s my dream. How much would I love to have seen a gay pride parade in Rome? The history makes me feel huge and small at the same time. It’s my favorite! I’m so jealous!!! I LOVE LOVE LOVE LOVE LOVE Italy!!! I’ve been to Rome, Florence, Venice, and a bunch of little towns in between!!! The gelto though… That was the amazing-est thing EEEEEEVVVVVVVVEEEEEEEEEERRRRRRRRRRRRR!!!!!!!!!!!!!!!!!!!!!!!!!!!! Tell her to take a neck massager!! She will need it after the Sistine Chapel! Hope she has fun!!! I’m so envious you got to see Florence and Venice! I loved Rome but wish I had more time there – we were only there a few days and I missed so many things! 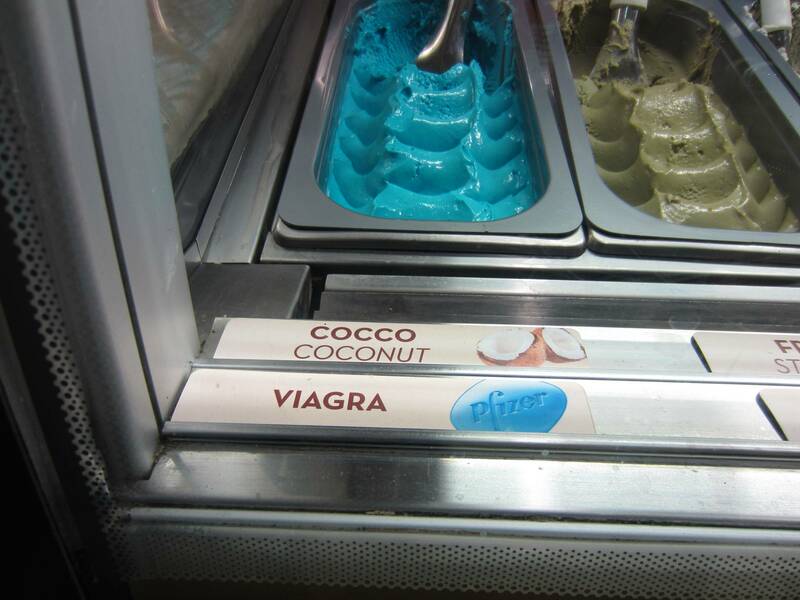 I miss the gelato. I’ve had it here, but it’s never as good as it was there! She thinks I’m joking about that! There is one room that is PACKED with people. People standing, sitting on benches, sitting on the floor, standing on benches…. EVERYWHERE!! All of them looking up! I missed half the art work because my neck started cramping. I’ve been to Germany, Austria, Slovakia (for a weekend), France, Switzerland, and Italy. All in 20 days! I wish I could have spent more time there but it was sponsored by school and some other organization. Everywhere was AMAZING!!! Except Paris…. It was really dirty and I had major jet lag and it just wasn’t fun. And they have gelato just about everywhere! That’s what I spent most of my money on haha! It was all in 20 days. So it wasn’t that great. I fell asleep standing up waiting for the elevator at the Eiffel tower. I liked the street art and the shopping and that was about all I liked haha. I don’t think I will ever go back. I would rather go back to Italy. I had serious thoughts of moving to Italy. We were pretty exhausted, too. I know how that is. And I agree – Rome was totally the best. I’d go back in a heartbeat. The beach in Italy is amazing to! I would say beaches but I’ve only been to one. My friend and I got lost on the beach one night and it was gorgeous!! The tide had come in and gone out so there was seaweed everywhere and I think a couple urchins. And the pizza!! It’s bigger than anything we have here in the states!!! I think like 4 of us split the cost and the pizza! It was HHHUUUUGGGEEEE!!!!! I had lasagna and mushrooms for the first time there. Haven’t had better lasagna since!! It was ah-freaking-mazing!!! No spaghetti though! I think we had homemade bread though. We ate in a little town near the docks to go to Venice called Jeselo. I mean we ate other places but that place really stands out because they had huge open shops all down the street at night, we had a huge pizza and lasagna, and we were staying in a hotel over a gelato parlor. It was really neat with cross between like a French and American ice cream parlor from like the 40s and 50s. It was amazing! You can post the link! Is it naughty? I’m guessing it’s naughty. Hee! What does this MEAN? Does it have…um…medicinal powers? Hmm. I don’t know about this. Right?! I was so confused when I saw it!! You should have read the comments underneath! They were hilarious!! I guess it’s tastier than taking a pill? So strange! *sigh* I’ve been to quite a few places in Europe. Not a ton, compared to all of Europe, but compared to the average American, I think. But never Italy. Personally, I think it would be kind of cool to do Mass with the Pope. I’m not Catholic, not even very religious at all, so they probably wouldn’t want me there. But, even though I have some trouble with believing in the miracles and with how twisted some organized religions have become, I do love the history and tradition of it. One of my European trips was that my choir spent a week in Worcester, England, singing for the daily services at the cathedral, and it was just like . . . whoa. People have been coming here to worship for hundreds of years. It was pretty mind-blowing, to be a part of that. So, yeah, assuming the Catholics didn’t kick me out, and I studied ahead of time so I’d know when to stand and sit and kneel and all that, I think it would be a really neat experience. I’ve been to England, the Netherlands, Austria, Germany, Italy, and France. I still have a billion more places I want to go. I want to visit ALL the places. I loved the history over there, too. Knowing I was somewhere that people had been for thousands of years…it just awed me. Ok, the only reason this is not ALL ZOMG ALLCAPS is that it’s rude to shout, so you can imagine – i am v excited for your mum. I, too, have been in Rome. And When I was in Rome I did As the Romans Did. I don’t mean present day Romans, of course, I mean those crazy old timey Romans. I got pissed on wine and considered all the debauchery. That’s not what I am excited about, though. And I doubt your mum approves (It was LONG AGO Amy’s Mum). What I am excited about is Pompeii. As it happens they have ganked a few statues and corpses and even some walls for an exhibition in London which is great for me, since I am not sure I will ever get to Pompeii. Also, all prayers welcome. For the suffering. It is a little known fact that I have Mormons praying for me all the time. Sadly, this is probably a bit tainted by the fact I am clearly going to hell for not being one of them, but still. Sort of kind of them. Although I am not a Catholic, I do like St Bernadette. She probably remained ‘inviolate’ due to not having anything to eat or drink for ages before she finally died. There are some MAD BUDDHISTY TYPE MONKS who sort of self embalm. There is a poisonous stream which they drink from, they stop eating real food and just some bits of pine leaves or something equally non foody, and maybe a bit preservativey. Then they go and sit somewhere and wait to die. When they are dead they are not only ‘inviolate’ but also sitting in meditation posture. This is what happens when you have very little going on in your life. On a side note, if you are a Tibetan monk you are left alone for ages, like more than a week, for your whole being to die before you are disposed of. It’s an interesting idea that deviates from our notion that you are dead once one of your pulses has stopped. This does not prevent me from being an organ donor, however, because I am a BADASS. I am so excited for her, too! I don’t know that I did what the Romans did, but we did have wine and fresh bread. And one day I just wandered all around soaking it all in by myself, and a Roman man attempted to pick me up, and I let him tour me around for a little and then I lost him by hopping on a bus when he got weird. This is a true story and I am quite proud of young-me. Mom totally read this. And all the comments. It was the cutest. I know, right? We need many prayers in the suffering-place. There are all kinds of suffering. We all have some. I would like it to stop now, please. Mormons don’t mind if you’re not one of them. They’re very kind. I’ve known a few, and honestly, they were some of the kindest, least-judgemental people I’ve ever known. Elaine, I love that you know about the self-embalming monks. How amazing is that? The MOST, is how amazing. I really know only the best people. So much so that it makes me have tears, sometimes. I am ALSO a badass organ donor. I want someone to have all my bits. I like that they might live on. Someday there might be little bits of Lucy’s Football walking around in other people. That makes me happier than happy. I don’t know why anyone wouldn’t be an organ donor. Somewhere in my email is a link to whole body donation, which I must get around to following up. If you donate your whole body they use all the bits to culture up in petri dishes to study diseases. The only thing is that there are FORMS to fill in. Organ donation is just filling in a ‘yes’ online now, and if you are on life support and just about to be switched off your relatives can donate bits of you on your behalf. Whole body you have to do yourself. When my uncle died he left money to me and a charity for blind children in Africa because he was briefly blinded as a kid. When my auntie (his sister, and never a beneficiary) found out how much it was she contested it because he hadn’t signed it. It was a terrible drama which could have gone all Jarndyce v Jarndyce so we called a halt to it and half went to my mum and half to her. What she didn’t know was that her son, who is well off, now makes regular donations to that charity AND when he was on life support they asked my mum for organs. At 80 odd you’d think he wouldn’t have much that was worth cutting out but she subsequently heard that his eyes had saved two people’s sight! It was only a couple of years ago when I saw my first dead human. I felt really drawn to the body and wanted to go right up and peer at it up close. Unfortunately, even I know that this is not really acceptable so I inhibited myself. I’d quite like my body to be buried in a way that could give nutrition to the earth, but I don’t think that’d be legal. I think my corpse was wearing makeup. I am not sure it really helps. Better to look dead than a fake version of what you looked like alive. I don’t know if it’s legal there, but here, green burials are becoming a thing. It has to be done in certain places, with permits, but more and more people are opting to be buried without all the chemicals and such so they can go back to the earth. NO MAKEUP. Corpses in makeup are the worst. I’m seriously still scarred by seeing my first dead human, who was my great-uncle, and not understanding why he was wearing base, rouge, and lipstick. “That’s what they do!” my parents told me. Wee-Amy decided then and there: NO MAKEUP ON MY DEAD BODY. Wee-Amy was much like Adult-Amy in that she thought a lot about morbid things. Yay! I hope your mom has so much fun on her trip! I am not Catholic, but went to mass when I was on my history tour to the East Coast senior year of high school. I’m not one to ascribe to organized religion anymore, but I can appreciate things about them that I don’t know about (such as mass). It was a good experience, overall. I would LOVE to visit Pompeii. It’s kind of odd that I first heard about it from a fiction book that I read, which romanticized it a little bit, but it just sounds like the whole story would be fascinating. I actually don’t mind mass that much. It’s comforting. It’s the same thing, it’s ritualistic – it’s kind of nice. The problems I have with Catholicism aren’t the mass itself, but some of the social issues. I actually really like a lot of Catholicism. I’m really torn by the whole thing, honestly. I know, right? Pompeii sounds awesome. I love historical things like that. That’s a LOT of “q”s. I like that. I have not heard of Cabin Pressure. It’s a radio show? I’m not great with listening. Maybe someday! It is! I never was interested in radio programs until Cabin Pressure. Of course the downside is I look insane, laughing while listening to it on my daily commute. I guess we’ll have to see what she comes back with to see if it’s blog-worthy! Maybe! Yay, Amy’s mom! How exciting! I am the only person in my immediate family who has never been out of the country (Canada doesn’t count here). My sister lived in Florence, Italy, for a semester when she was in college. My parents went to visit her. Then they stopped in France on their way home. My sister spent that spring break in Spain. My mother has since been to England and South Africa. I’m a total loser. Hahaha! Sigh. You are not a loser! You are a WINNER! Leaving the country does not make you a winner. Being AWESOME does. You win awesomeness! And you still have plenty of time to go adventuring! So much time! I am DYING to see Stephen King’s house. I’ve seen photos, but have never been to Maine. It’s on my list of places to visit someday!